We thought our recent test drive of the new Maserati Levante crossover in the Holy Land was an interesting experience, but Maserati itself has now done something just as, shall we say, unique, if not more so. In order to demonstrate the Levante’s off-road capabilities, Maserati staged a race between the SUV and a horse. And not just any horse, but a pro racing horse. Maserati even enlisted the help of the Skelton brothers. Dan Skelton, it so conveniently works out, is already a Maserati brand ambassador, as well as a professional horse trainer. His brother, Harry, is a highly experienced hunt jockey. The race also became a brother vs. brother/horse event, with Dan piloting the Levante against Harry and his horse, named Dinnie O. The race took place in the Cotswolds in England, and each brother was given his own route, but the Levante had a longer one through "rough terrain that was unsuitable for horseback." Honestly, the terrain doesn’t look that rough. It wouldn’t be a challenge for any Land Rover. 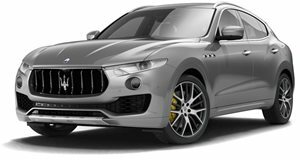 But anyway, we get the point Maserati wants to make: the Levante, especially this one with its 3.0-liter turbo diesel with 275 hp and all-wheel drive system, can handle off-road conditions. We also tried out what the Levante can do off-road and were pretty impressed. It’s just too bad we couldn’t arrange this Levante vs. horse race ourselves. That would’ve required us finding a race horse, and we honestly have no clue how to do that. So, enjoy the race!